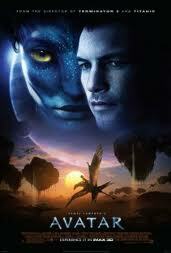 On 31st January 2010 the epic science fiction film Avatar became the first film to gross over $2 billion worldwide. and it was also one of the films I watched during my recent break form the Internet. written and directed by James Cameron, and starring Sam Worthington, Zoe Saldana, Stephen Lang, Michelle Rodriguez, Joel David Moore, Giovanni Ribisi and Sigourney Weaver. The film is set in 2154, after humans have severely depleted Earth’s natural resources. So a group called The Resources Development Administration (RDA) is set up to discover the whereabouts of valuable new natural resources and they are currently exploring the biosphere of a densely forested habitable moon named Pandora, which is orbiting the gas giant Polyphemus in the Alpha Centauri star system. Pandora’s atmosphere is toxic to humans, and is inhabited by the Na’vi, 10-foot tall (3.0 m), blue-skinned, sapient humanoids who live in harmony with nature and worship a mother goddess called Eywa, So scientists including Dr. Grace Augustine (Sigourney Weaver), head of the Avatar Program, have developed Na’vi-human hybrids called “avatars”, operated by genetically matched humans; like Jake Sully (Sam Worthington), a paraplegic former marine, who replaces his deceased twin brother as an operator of one in order to collect biological data. Unfortunately Jake’s Avatar is attacked by the local wildlife, but luckily he is rescued by Neytiri (Zoe Saldana), a female Na’vi. who takes the encounter as an important sign from the Goddess & takes him to her clan, whereupon Neytiri’s mother Mo’at (C. C. H. Pounder), the clan’s spiritual leader, orders her daughter to initiate Jake into their society and Over the next few months, Jake learns the Na’Vi ways and grows to sympathize with the natives. Meanwhile Colonel Miles Quaritch (Stephen Lang), head of RDA’s private security force,asks Jake to gather intelligence about the Na’vi and the clan’s gathering place, a giant arboreal called Hometree, on grounds that it stands above the richest deposit of minerals in the area. When Grace learns of this, she transfers herself, Jake, and Norm to an outpost. Jake reveals his change of allegiance when he attempts to disable a bulldozer that threatens to destroy a sacred Na’vi site. When Quaritch shows a video recording of Jake’s attack on the bulldozer to Administrator Parker Selfridge (Giovanni Ribisi), and another in which Jake admits that the Na’vi will never abandon Hometree, Selfridge orders Hometree destroyed.Despite Grace’s argument that destroying Hometree could damage the biological neural network native to Pandora, Selfridge gives Jake and Grace one final chance to convince the Na’vi to evacuate before commencing the attack. While trying to warn the Na’vi, Jake confesses to being a spy and the Na’vi take him and Grace captive. Following the film’s success, Cameron signed with 20th Century Fox to produce two sequels, making Avatar the first of a planned trilogy.